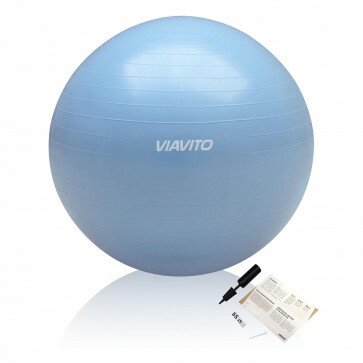 This anti-burst gym ball is blue in colour and features a 65cm diameter which will suit people ranging in height from 168cm (5’6”) to 178cm (5'10"). Manufactured to the highest specifications and tested rigorously, it will withstand heavy usage with a maximum load weight of 200kg (31 stone). Add it into your fitness routine and perform a diverse range of exercises which can work your whole body: core muscles and your upper and lower body. Perform sit-ups, stretching exercises, resistance work, drills to improve flexibility and balance and plenty more, plus you can add free weights to any reps to increase the intensity and effectiveness. The anti-burst design and the ribbed pattern that grips floor surfaces well combine to ensure confident usage, and included are the instructions and a hand pump so you can inflate the gym ball correctly before using it.